Crave the Concave! A stunning new Sterling Silver Concave Ring Band. Size 7. Bright Sterling Silver. 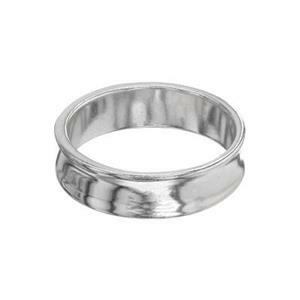 For more Architectural Fun take a look at our complete listing of Silver Rings. Very shiny, as if rhodium coated, but wasn't mentioned in the description. Recently, it did turn a little golden color and don't know why or what it was exposed to. Perhaps you could give me some insight? ********************************************* Halstead Customer Service response: Thank you for your feedback. It sounds like it's tarnishing. I'm not sure when or where the tarnishing occurred but here is a blog that we wrote that may help you if it's becoming tarnished in your studio: https://blog.halsteadbead.com/2013/11/05/7-silver-tarnishing-culprits-lurking-in-your-studio/. We do appreciate your comments. Thanks for taking a moment to write a review! Fit is good, didn't expect it to be so shiny. Maybe I didn't notice that it said 'rhodium' on the listing page.